The 2017 Farwest Show is the place to meet like-minded nursery industry professionals. In today’s busy business climate, connecting via email and social networks is deceptively easy. But how often do these connections extend beyond the computer screen? There’s no doubt that relationships are important in business. That’s especially true in the nursery industry, whether the connections made are with potential customers, possible collaborators or future cohorts. Close, reciprocal relationships can help you grow your business, advance your career and enhance your professional reputation. You can find out about great business opportunities, learn of new job prospects, or even discover new realms within our broad and diverse green industry — realms that can take your business and career to the next level. Such connections are not always easy to make. Fortunately, we’ve designed the Farwest Show as a perfect place where you can connect in person, expand your network and build your success. You may even strengthen the connections you made previously on social media! In this article, we will discuss networking opportunities that are available at the Farwest Show, and ways you can take advantage of them. But first, let’s talk about what not to do. Most of us are in the nursery industry because we love plants of all kinds, but the one specimen that doesn’t do well at any trade show is the wallflower. We don’t mean flowers from the genus Erysimum, but rather those individuals who come to the show and then seem determined to hide in plain sight. You’ve seen them. We all have. They sit in their booth. They read. They check their phone. And they give no indication they’re interested in talking to anyone. Networking can seem difficult, and introductions can be awkward, but they get easier with time. When you don’t see anyone you recognize, that’s the time to seek out other folks who are attending the event solo. Smile and introduce yourself. Exchange information and business cards. Share your goals. But just as importantly — listen. That’s when you learn. If you think about what you’re hearing, you will find common ground with people, or ways you complement each other. Either way, it will be of professional benefit. Your first and best Farwest networking opportunity is the expo floor itself. It has thousands of industry professionals coming together, representing every sector in the industry. And what’s wonderful about the green industry is that every business is unique. All those connections waiting to be made. If you’re an exhibitor, instead of scrolling your email, look into the aisles and engage with your neighboring exhibitors between customers. You will catch more leads with smiles than from behind a screen. If you’re an attendee, walk the floor — booth by booth. Talk to people. See what they offer and what they are up to. The Farwest Show opens on Wednesday, August 23, but we advise getting here a day early, so you can see Oregon Nursery Country. Oregon has more than 600 wholesale growers, plus numerous retailers, and we have organized Nursery Country Tours to take you directly to some of the best operations in the state. Attending a tour is a great way to meet other horticulture professionals and expand your networking. Spend the day with colleagues and you are sure to strike up a conversation about what you find, learn or observe on the tour. This year there are three tours to choose from. Be sure to register by July 31 to save with early bird pricing, and don’t wait too long. The tours have been known to sell out. 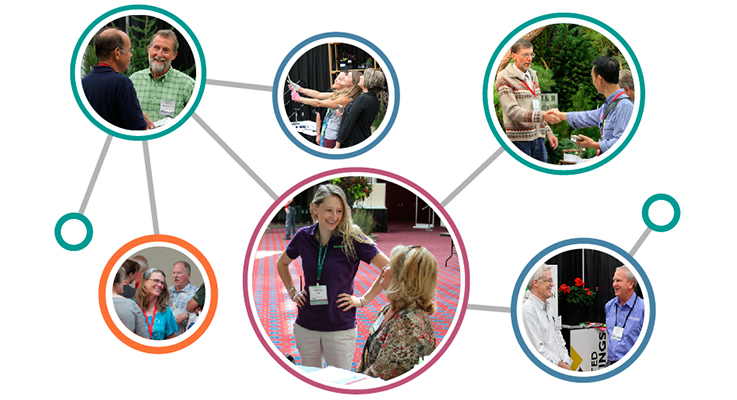 In addition to the expo and tours, we have numerous events at Farwest that are specifically designed for networking. These are occasions where you can easily break the ice, have fun and meet some really cool people. • As Wednesday (Day 1) concludes, don’t miss out on Farwest’s newest social event — the Farwest Happy Hour social event! It’s conveniently located right in the Oregon Convention Center, in the Pendulum Lobby. You can enjoy a cold beverage, while reflecting on the first day’s events with fellow exhibitors and attendees. • Thursday (Day 2) brings back the legendary Farwest Pub Crawl. Meet up with our spirited Beer Sherpas in C Lobby, under the Dragon Boat. They will help you achieve the right frame of mind before they guide you on your journey to the Pub Crawl venues. Attain Beervana. New friends and awesome beer are just a streetcar ride away! • Are you new to the industry? Don’t miss the Emergent Networking Event. This event is focused on connecting young and new industry professionals together. Join the fun on Wednesday (Day 1) at 3:30 p.m. Meet other young professionals for a casual, fun and friendly visit. This event is located in VIP Room B, above C Lobby. You’re steps away from making new friends and you’ll catch a break from the trade show floor. • Women are an increasingly powerful part of the nursery industry. On Thursday (Day 2) at 3:30 p.m., the Women in Horticulture Event takes place in VIP Room B, above C Lobby (same location as Emergent Networking Event the day before). This casual networking event is designed to cultivate lasting career support. Come share insight into company culture, career goals and challenges that are unique to women in the industry. This year, meet Leslie Halleck of Halleck Horticultural LLC, who specializes in horticultural business and marketing strategies. This is a green sisterhood you need to join! The number one rule of successful networking is, don’t forget to follow up! It’s easy to return home exhausted with a stack of business cards. It takes intent to drop those folks a quick note or email, but intent is what people will remember. You have their information for a reason. Use it. Instead of being part of a sea of faces, you’ll become a permanent connection. Of course, you can also friend them on Facebook or Instagram, connect on LinkedIn or follow them on Twitter. However you decide to follow up, it’s wise to remember that no plant grows if you just plant it and walk away. It takes care and effort to build your connections before, during and after the show, but your resulting growth will pay great dividends professionally and personally.